Massage therapy is our core business and we feel very passionate about our job, for this reason we are always happy to provide advice and tips to our patients as well as answer all of the questions related to massages. For this reason we would like to share with you some of the most frequently asked questions we receive from patients wanting more information on different aspects of massage therapies. At our Toowong centre we are always making sure our customers receive the best therapies and thorough information. On your first appointment your massage therapist will ask you to fill out a health history form. Once you are done your therapist will ask you some general questions to identify the areas that need to be worked on, then depending on your choice of Myotherapy or Remedial Massage, your therapist may do some orthopaedic testing as well. From there, you and your therapist will discuss the treatment, and they will begin. Afterwards, there may be some rehabilitation planning, and discussion about your prognosis. It really depends on the type of massage therapy you will be getting. If you require a full body massage most patients undress, keeping their underwear on. You will be giving privacy to undress and then you will be covered with a blanket or sheet at all times. We’re really mindful at Mobilise of our patient’s comfort at all times, and you are encouraged to let us know of anything that may help this! If you are having a Myotherapy treatment, we may leave some clothes on – as the treatment may be more focused on one region. We keep the clinic at a mild temperature, so our patients are as comfortable as possible. What do I have to do during a massage therapy session? Mainly, relax and be comfortable. Your therapist might ask you to change positions or move so she or he can treat certain areas. Otherwise you won’t have to do anything expect relax and enjoy the session. We love feedback – and want you to tell us everything that you’re feeling – it will help us to give you exactly what you need! What does a massage feels like? All massage techniques are different so it really depends on the type of massage you are getting. For example if you are getting a Swedish massage your session usually starts with flowing strokes that will assist calm your nerve system and therefore relax exterior muscle tension. With Remedial Massage, the treatment may use some deep tissue or trigger point techniques – but we will make sure you’re coping with what we do, and are totally informed as to why we are choosing these techniques. If you’re needing a Myotherapy treatment – there are many techniques we may use to treat your pain, and we will talk you through all of them. All our therapists are extremely well trained, and really knowledgable – so if you have any questions at all about why we’re using certain techniques, just ask! 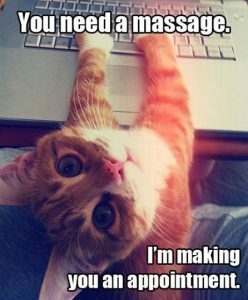 If you have questions while receiving massages don’t hesitate to ask your therapist, or give us a call before your treatment to talk to your Myotherapist or Remedial Therapist about what to expect – we are here for you! Call 0473 090 442 today!